3 reasons 'Ant-Man and The Wasp: Lost and Found' deserves to take you on a little trip – AiPT! Mark Waid and Javier Garron invite you to take a little trip with them in this endearing, strange story — you should go. 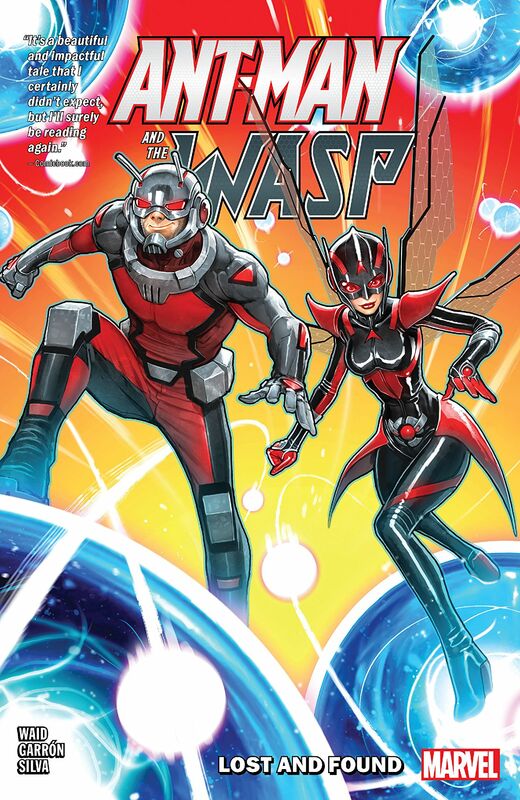 Hot off their theatrical duo debut, Ant-Man (Scott Lang) and The Wasp (Nadia Pym) are here in an all-new comic story that promises some serious scientific debacles, fun, and character-first storytelling at the hands of writer Mark Waid and artist Javier Garron on the way. Does it deliver? Yes! — for the most part — because, the things it does well, it does very well! You know…I understand the argument that all the MCU movies are too funny and light, but I also think that they have their heart in the right place. The way those jokes and brevity can be used to great effect is no clearer than at the hands of a master dialogue crafter like Mark Waid. He writes character first, giving Scott and Nadia distinct, different voices and vocabularies, and then peppers their conversations and even asides with one-liners or even bait and switches that really deliver in both sincerity and earnest, earned laughter in a way few writers can — Scott can be funny and still care about his daughter, Nadia the same but about her relationship with her estranged father. Lines like Scott’s “I could be standing on the back of a space vampire!” and Nadia’s “because you’re old” in response to Scott asking why she keeps calling him “Mr. Lang” both kill in different, unique ways that are true to the characters and speak volumes about how they’re feeling and thinking in ways that are rarely captured this well. Speaking of things that are rarely captured this well, Javier Garron’s art is a real trip throughout this story’s numerous twists and turns. The Wasp goes blind for a bit, both she and Ant-Man shrink smaller than an atom and larger than the Earth at will, multiple realities start bending all around themselves in unexpected ways (Black Lodge backwards speak included), and more! Lost and Found is far and away from a normal superhero story and its visual storytelling keeps perfect pace. Aliens, ants, and alien ants are all brought to life with the same attention to detail and crispness that Garron brings to everything here and it’s all the better for it — wrapping up everything that can be good about an Ant-Man story with little of the errata. In Lost and Found, there is no central villain or evil force. Instead, there’s only the universe, its impartiality working both for and against our main characters in equal measure as they traverse any number of quantum realities or problems thrown at them with aplomb. This means things move quickly — as quickly as the speed of light. Without the need for the build up of a major villain or their nefarious master plan, we can get right to the good character and world building that works as the central draw here instead, the stuff Waid and Garron really obviously like and want to revel in — things happen quickly, with little regard for the consequences, but that’s the way the microverse works and it makes things feel really fun and unpredictable in a truly different way from most books out today. Naturally, while this teeny, tiny but also large and warm Ant-Man and The Wasp story is pretty good, it’s not perfect. So where does it lose a few points? In two categories: the technobabble, and the layouts. First, without a major villain, which works most of the time, the story too frequently relies on extremely obscure or rote (but largely sound) scientific language to explain the ins and outs, ups and downs, and blacks and whites of this complex plot in an off-putting and gatekeepy way that might make sense to the characters and those in the know but makes some scenes especially hard to get through. Second, while Garron’s art is impeccably detailed and impressive in its uniqueness and sharpness — brought to life by colorist Israel Silva — it’s far too often pressed up against itself. Pages open up to panels that look more like Ant-Man and The Wasp ransom notes, cut from MCU movie posters, than they do comic pages. It’s a difficult visual language to follow that sometimes plays to the story’s frantic pace but more often makes things feel kind of clumsy and overwhelming. This is a compelling, earnest, and fun story that clips along at a surprisingly fast pace and offers a whole lot of what makes these characters good with very little of the bad getting in the way. Waid and Garron settle into a nice pace that sets up a macro and micro scale for these heroes to play on beautifully and I, for one, would be more than elated to see them take it anywhere from here if they were given the opportunity. Mark Waid and Javier Garron deliver a fun and crisply paced Ant-Man and The Wasp story that gets a lot right, especially in focusing on characters first, but occasionally things go awry when they focus in too much on the science or the crazed heights the art can reach. Waid writes laugh out loud funny dialogue that fits the situation and doesn't deflate the tension or severity of things -- it's earnest and effective. Garron's art is a fun-house mirror adventure that takes our characters through all sorts of twists and turns that are immeasurably fun to keep up with. Both creators here need to reign in their worst habits a bit more -- Waid with the technobabble and Garron with the business of that same fun-house effect.